This chapter starts with the depiction of the main research question and premises of the book. It clearly states that the point of departure of this book not the idea of understanding the life-worlds of migrant-origin people and their descendants in relation to the cultural, social, political and religious references originating only from their homelands. Rather, it inquires about the production of human existence in changing social, political, economic, cultural and legal contexts. Rather than concentrating on roots and origins, it concentrates on routes taken by migrant-origin individuals and their descendants. 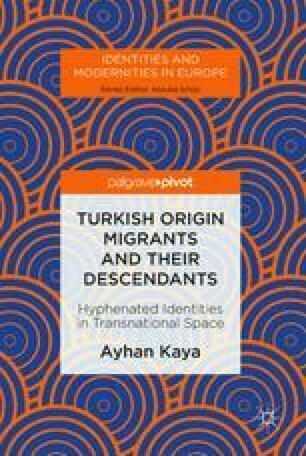 In this regard, the Introduction Chapter explains why the author prefers here to use notions such as ‘migrant-origin’, ‘Turkish-origin’ and ‘Muslim-origin’ instead of ‘migrant’, ‘Turkish’ and ‘Muslim’ in order not to essentialize those individuals with their home-driven cultural, ethnic and religious identities, which themselves are subject to a constant process of change over time.